Recognizing an increasingly significant inter-relationship between the rapid growth of new technologies and the business and governmental sectors, this lecture series brings distinguished individuals to Penn Engineering to interact with students and faculty on broad issues affecting technology and science, research and policy. Abstract: The oil and gas industry is difficult to understand for many. We all hear about oil price in the news, but few people understand the high technology content in the upstream industry which acts as a price increase buffer, especially since unconventional oil production has become prominent. With a consistent goal of reducing environmental impact and costs while improving productivity, this is a time where innovation is at its highest. A number of examples of where innovation is driving the industry will be discussed. The vast breadth of engineering and science competencies required to maintain oil and gas exploration and production will also be reviewed. 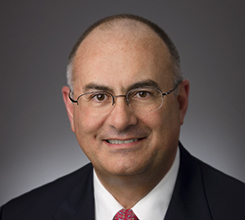 Bio: Gregory L. Powers, Ph.D., is Halliburton’s vice president of Technology. His responsibilities include overseeing Halliburton’s technology investment and intellectual asset management, the development of new products and services, and the strategy and structure of the company’s global technology organization. Dr. Powers’ technology experience spans three decades of work in engineering, research and development in a broad range of industries. He has worked in many U.S. locations and extensively in Europe and Asia. Most recently, he was the executive vice president of Research, Development and Biofuels Operations for Verenium Corp., a developer and producer of specialty enzymes. Prior to that, he was vice president of Global Engineering for United Technologies’ Carrier Corp., where he was responsible for all research and development and engineering activity related to heating, ventilating, air conditioning and commercial refrigeration. Dr. Powers has also worked in global technology roles for General Electric’s Specialty Materials, Lighting and Plastics divisions. Dr. Powers earned bachelor’s, master’s and doctoral degrees in Chemical Engineering from the University of Pennsylvania.